Ok... so you've already acquired your engagement and bridal portraits and the wedding day is fast approaching! Now what? 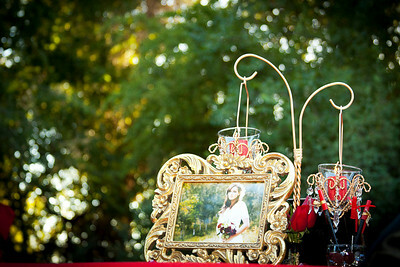 The following are several fun ideas for displaying your pictures at your wedding reception. organic look! It is the perfect addition to have on your sign in table or next to your sign in table depending on how tall the branches you use are. I recommend either finding or buying clean branches so the focus is on your pictures and not distracted by leaves or a lot of messy bark. And if needed sand and spray paint a clean subdued color. White can even be a bold but clean look. Many home furnishing stores will sell cleaned branches for living room decor and they make the perfect fit! The swirlier and curvier the branches are the better since it creates such a unique look! There is also so much variety you can find with something like this since they come in a variety of colors. 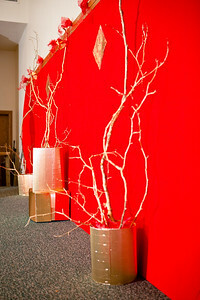 The picture (left) is my DIY I created for a Chinese New Year Event. I simply collected several large branches while on a walk (there was a storm that blew many down) and I laid them out on a tarp in my backyard, used gloves to break off any loose bark. Then spray painted them with gold spray paint from home depot. To stabilize them they sat in buckets with damp sand and covered the outside with gold decor liner. And "Walah!" A elegantly decorated wall. So if this look goes with your wedding, whether holiday, glam, oriental etc, add some pictures as ornaments. To attach pictures to the trees, just add a hole punch at the top and a little piece of twin or string to hang it on the tree just like you would a Christmas ornament. Even if you don't want to display pictures, you could create a sign in tree. 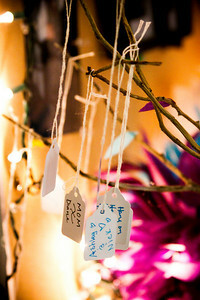 I loved how at one of the receptions I shot there were these adorable tags that people could sign when they walked in and then hang it on the branches of a small tree. It was a wonderful way to visually represent the love that was present. Depending on the size of your branches, you can even consider implementing small Christmas lights, especially if you are having an indoor night time reception. This will give that additional elegant glow. Small discrete battery operated light strands on flexible wires are a perfectly elegant touch. The battery pack of the lights can easily hide in the base of the vase. And in a low light setting, will make your pictures glow. To put the tree pot together, simply insert a large block of green flower foam into the base of a sturdy heavy set vase. To wedge it in there tightly buy a block slightly larger than the vase and shave off the edges until you can force it into the ceramic pot, or for larger branches, cement into a bucket or set them in with sand to ensure the vase will be heavy set and the large branches will stay in place. The photos can hang from the branches of the "tree" or you can have them blossoming from the tree, like this wire picture display. No need to over complicate displaying pictures! I love clothes pins! I don't know if it is the vintage cutesy look to them or what but I love the natural "out of the box" look you can do with them and you can do so much! Just like the photo tree you can have the looser look of free floating memories that wave about in the afternoon breeze. 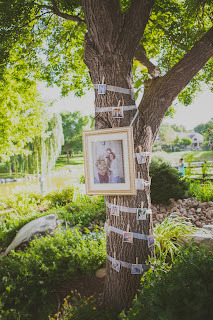 You can hang a string of them from one area to another to create a fun collection or timeline of your love story. Also you don't have to use clear strong but you can go all out with fun unique ribbons! You have so many options with a string of pictures, such as twirling around a tree trunk, dressing up a wall by drooping them across it etc! For a rustic look use hemp string like the photo pictured above. your quests will always see a smile an not the back of a photo. 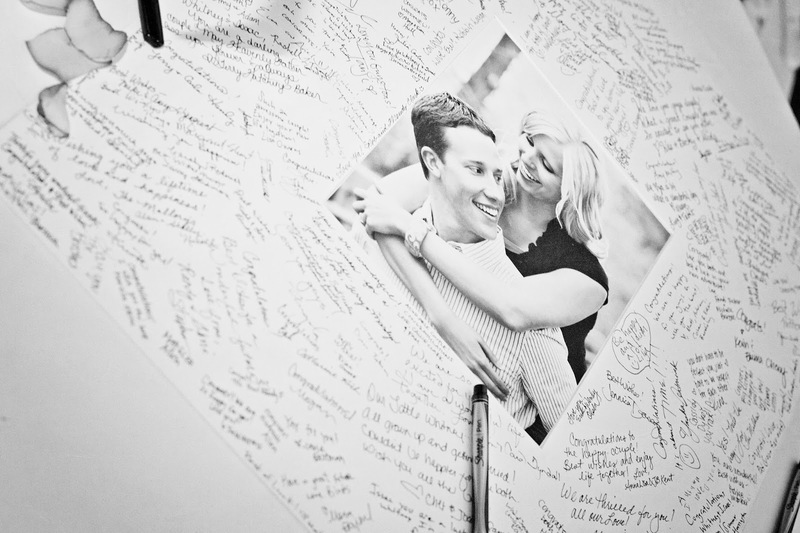 In the photo (above) this couple hole punched copies of their photos along with copies of old family history photos in a sort of "continuing the line" of love. The holes were in the corner of the photos and zigzagged over one main line to keep them straight. 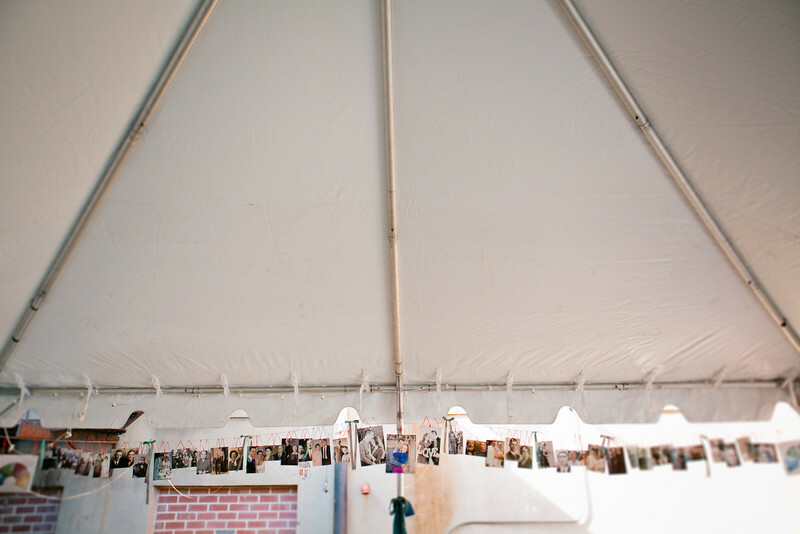 You can hang other fun additions too to fit the look of your wedding. For example, origami crane, paper hears, little mirrors etc all make a loves addition. You could even complete your collage with hanging initials or a word such as "love" in their separate letters all strung up! in there something about kissing in the tree... lol. If you reception is out doors then don't be afraid to go crazy! With ribbon and pictures hanging from the tree branches. You can hang the pictures by themselves or collect old frames from the attic or a nearby thrift store or antique mall. Oval frames look great! Be sure to have a variety as well. To evenly hang the pictures that are square or rectangle, then be sure to use string for each of the top corners. This will also help avoid a tangle mess. Depending on the time of day of your reception you may want to think about lighting in the trees as well! Small lanterns hanging among the frames or even candle light would be lovely. If your event is outside, work with the weather. Small 3 x 3 photos with a white border on them glued back to back and hanging in the trees with several other ribbons will have a graceful touch that embraces the surrounding. If there are large trees at the location of your wedding reception then consider hanging or tying a framed picture to the tree. 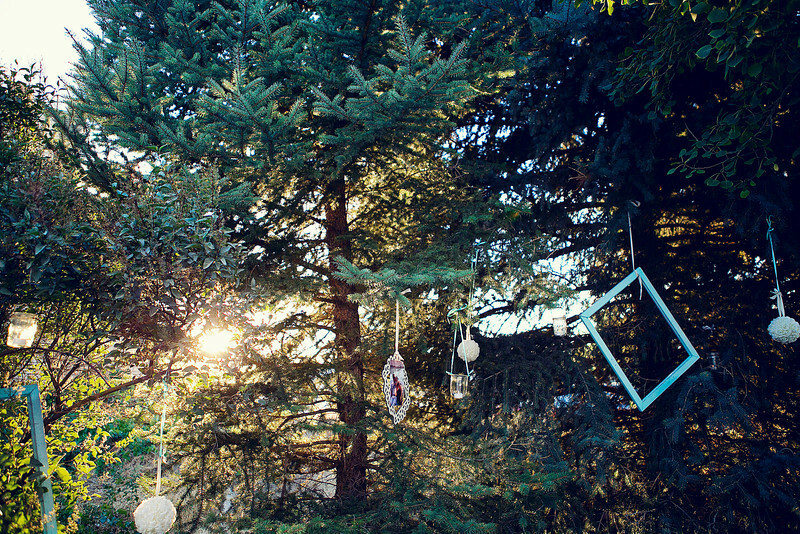 To avoid hurting the tree, attach ribbon to the back of the frame and tightly encircle the tree to get it to stay. Look for a bump or groove for the ribbon to rest over to ensure a more secure setup. 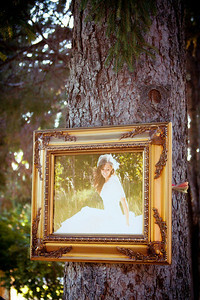 Michael's sells these cute ornate laser cut wood frames that work great as a lighter option for a frame to hang in a tree, such as this bride and groom's engagement picture (above) hanging in the pine tree with other ornaments. 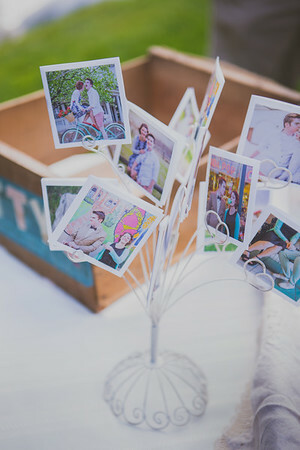 This is probably one of the most commonly used ways of showing off all your fun pictures at the reception! But you don't have to go too far out. If you are thinking of using frames but want to save money they try using frames from friends and family. 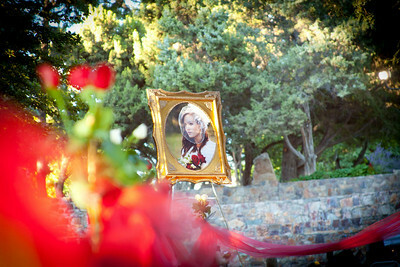 Simply temporarily put your pictures over theirs until after the wedding! It is easy to mix it up a little too much so depending on the look you would like to go for try to match the frames metal or wood style so you don't end up with a modge podge of frame decor! 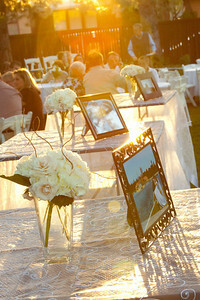 Frames are great for table decor and center pieces for all over the wedding. And a few tips regarding the frames. Stick to a smaller frame size, if you are using them as centerpieces. 5x7 or smaller. A 16 x 20 bridal print is the size that is most popular to have displayed at the entrance of the wedding. 20x30, if you want to go big. If you plan to stick to tradition, i.e. 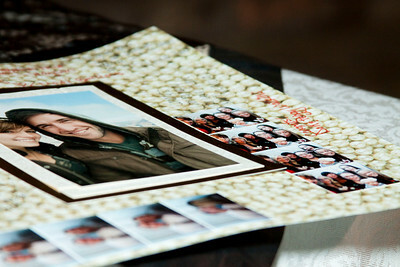 The groom can't see the bride before the wedding... then tip down any bridal photos or cover them. Makes the surprise a bit more fun! Don't have the budget for a lot of elaborate frames? Collect several mason jars, print your engagements on transparency and put fake candles in for a glowing addition to your tables and your memories will glow for your guests throughout the evening. 5. Take advantage of your surroundings. Before the wedding when you are touring the venue, take note of the surroundings and where you can hang pictures. You'll often find there is really so much to work with when you are looking for it! How adorable would a line of pictures be hung across this scrolly gate! Whatever you are thinking of doing, be sure to ask permission in advance so there are no surprises on the day of! You would be amazed at how many cool things you might find to display your pictures on in these sort of places. 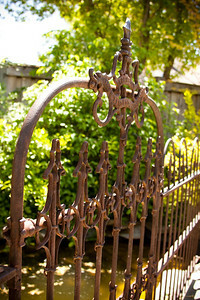 An old wooden door or metal siding, a decorative divider. Once shopping at an antique mall I came across some old metal siding that came out of an old hotel in Denver and I used if as a child portrait studio backdrop for years to come. Use thick ribbons to hang from the object to tie in your wedding colors. Such additions can work wonder for decorating your reception, especially if you are wanting to cover up an undesirable area. Even hanging curtains and from the poles pinning up foam board mounted photos an undesired wall suddenly becomes a collage attraction for your quests to look at. If you do have the ability to decorate a large space like a full wall of a reception hall, think outside the box! 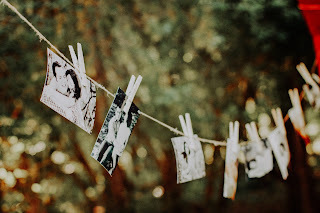 Consider making a start to finish dating timeline wall with pictures of your courtship. Gator board or hard board prints are adorable hung with wide set ribbon and a big bow on such decor! Some items to keep an eye out for when shopping are: Old wood palettes, wood boxes to double as a shelf, old doors, antique room dividers , and mini frames and frame Christmas Ornaments for hanging pictures. When touring your venue location, look around for trees and areas your can hang these items from. Consider the weight too and if renting a venue, be sure to ask what will be allowed. Hanging items from a tree, for example might not be allowed. 7. Slide shows and Videos! Tell your guests a bit more about yourselves as you great them with a custom made slide show as they wait in the wedding party line, at a sign in table to area of your venue that has a screen available for guests to sit and watch your story. 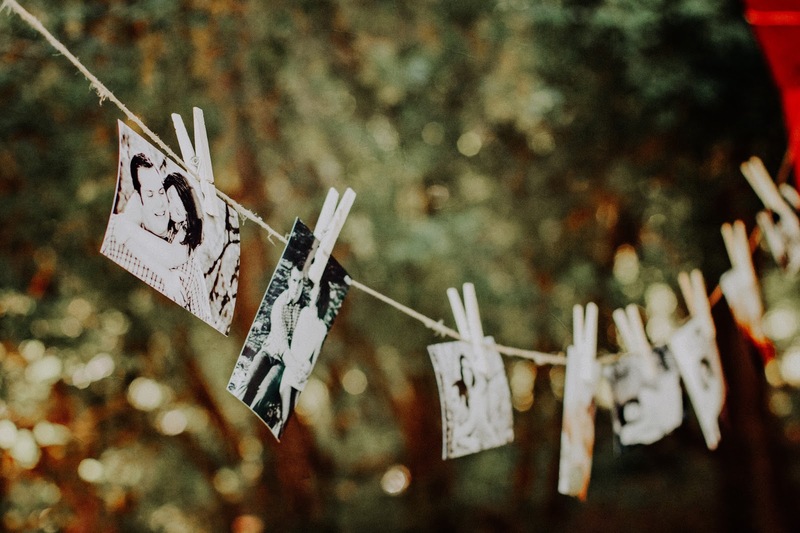 Share a short 10 minute history by starting the slide show off with childhood photos and work your way up to your dating life, engagements and bridal shots. If you are not having a welcome line then simply display the TV in an area quests can enjoy it. 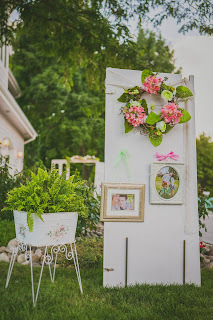 For a vintage vibe wedding, decorate a portion of the outdoor lawn as an old time lounge theater complete with mini popcorn etc for your crew to enjoy a projected video. Consider making your slideshow 100 images or fewer as each image lasts about 4-6 seconds and that is a comfortable timing for guests to sit through watching your story. Better yet... 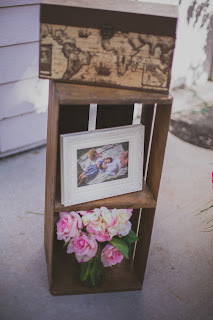 Combine your slideshow with your love story! Whether it is a video you have made that is used for your save the date on face book or just a wonderful couples montage that tells more about you. Happen to catch your proposal on video? That can be added in too. You could also have an interview incorporated to share bits about how the two of your met, fell in love, the first kiss. This will be a treasure for years to come and if it is incorporated into the program, a lot of laughter and tears. 8. Sign in Guest Books. A fun and popular way to let your quests sign in! 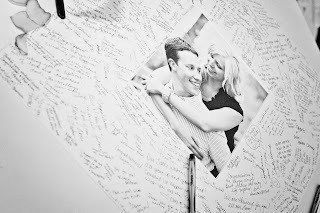 Scrapbook or have a custom sign in book made with your engagements, bridals/ formals and even your favorite dating pictures. Recommended: do a lay flat option as this will be easier for guests to sign in and have a fine art classic album feel to it. Also be sure to test the pen you are using in advance that it won't smudge and smear easy. To take this idea out of the box, turn one matted engagement or pre-wedding formals portrait into a matted print and your guests can sign in their good wishes, love and all. What another fabulous way to have it all in one place, a visual representation of the love that day. And in your new home together, that can always be on display. Consider the number of people who will be attending your wedding to properly decide what size print and matte to do. Craft stores such as Hobby Lobby and Michael's typically have costume matting options and framing. A 16 x 16 sized matte is a safe option. Let your quests sign in in their own personal goofy way! Photo booths have rapidly become a reception favorite! 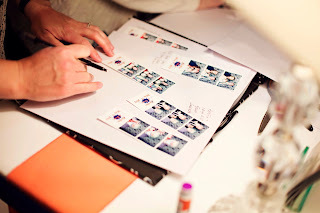 Friends and family can glue their own pictures to an already scrapbook ready page for your fun keepsake when the day is done! 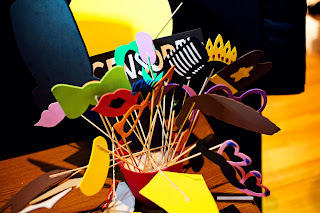 Most photo booth services offer this, so if you want to customize it further just let them know! 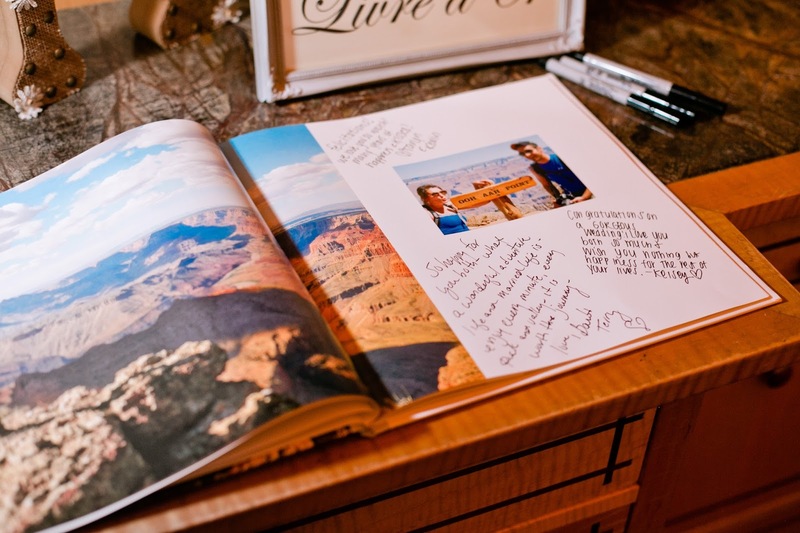 Be sure to pick non-busy patterned paper so that the messages from your guests will be legible. This is a personal favorite. It came out in popularity around when I was married, so we had them on our cake. Have your formal/ bridals or engagement pictures printed on edible frosting/ chocolate and attached to your wedding cake! It can make for a very unique touch and a tasty one!